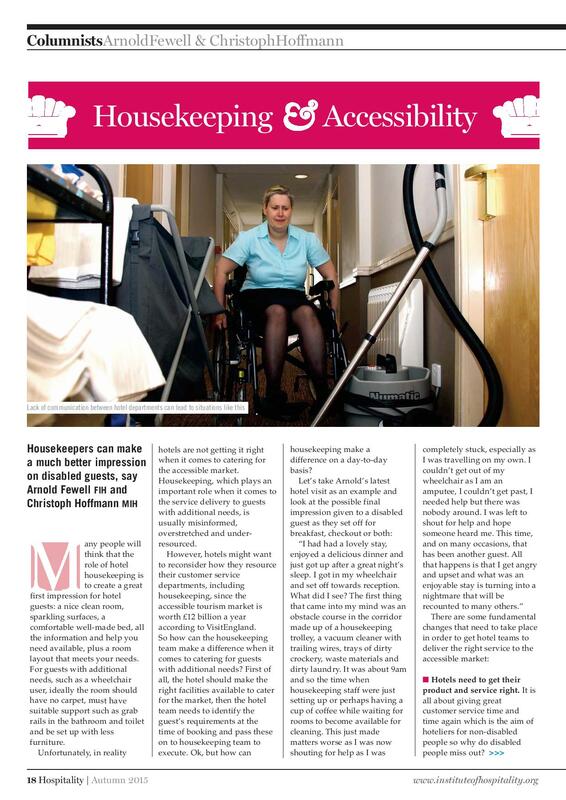 Housekeepers can make a much better impression on disabled guests, say Arnold Fewell FIH and Christoph Hoffmann MIH. Many people will think that the role of hotel housekeeping is to create a great first impression for hotel guests: a nice clean room, sparkling surfaces, a comfortable well-made bed, all the information and help you need available, plus a room layout that meets your needs. For guests with additional needs, such as a wheelchair user, ideally the room should have no carpet, must have suitable support such as grab rails in the bathroom and toilet and be set up with less furniture. 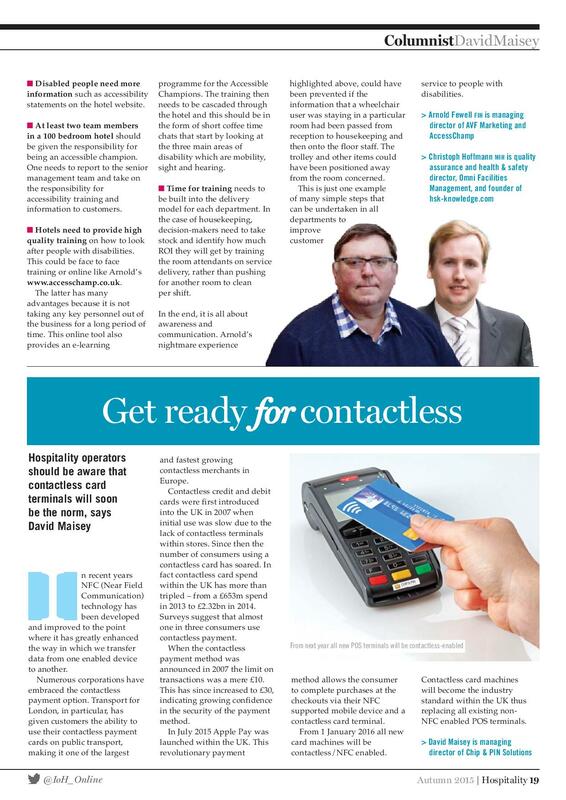 Unfortunately, in reality hotels are not getting it right when it comes to catering for the accessible market. Housekeeping, which plays an important role when it comes to the service delivery to guests with additional needs, is usually misinformed, overstretched and underresourced. However, hotels might want to reconsider how they resource their customer service departments, including housekeeping, since the accessible tourism market is worth £12 billion a year according to VisitEngland. So how can the housekeeping team make a difference when it comes to catering for guests with additional needs? First of all, the hotel should make the right facilities available to cater for the market, then the hotel team needs to identify the guest’s requirements at the time of booking and pass these on to housekeeping team to execute. Ok, but how can housekeeping make a difference on a day-to-day basis? Hotels need to get their product and service right. It is all about giving great customer service time and time again which is the aim of hoteliers for non-disabled people so why do disabled people miss out? Disabled people need more information such as accessibility statements on the hotel website. At least two team members in a 100 bedroom hotel should be given the responsibility for being an accessible champion. One needs to report to the senior management team and take on the responsibility for accessibility training and information to customers. Hotels need to provide high quality training on how to look after people with disabilities. This could be face to face training or online like Arnold’s www.accesschamp.co.uk. The latter has many advantages because it is not taking any key personnel out of the business for a long period of time. This online tool also provides an e-learning programme for the Accessible Champions. The training then needs to be cascaded through the hotel and this should be in the form of short coffee time chats that start by looking at the three main areas of disability which are mobility, sight and hearing. Time for training needs to be built into the delivery model for each department. In the case of housekeeping, decision-makers need to take stock and identify how much ROI they will get by training the room attendants on service delivery, rather than pushing for another room to clean per shift. improve customer service to people with disabilities.